Links & References... please find below links to Reference Works, and some of our Favorite Online Internet Web Sites and Resources. A List of References to publications and further printed information. Brian Stevenson has been writing a very well researched and interesting series of informative articles aimed at identifying and shining new light on the lives and work of many of the Victorian Era Mounters. He has a fact-filled website where these are now available. His series of papers can be accessed here. Allan Wissner's fine website dedicated to early microscopes and accessories can be found here. This site is both image and information rich, and a pleasure to browse. Recent British Foraminifera of the Channel, An Amateurs Account of British Foraminifera is Brian Darnton's beautiful site. Arranged as an ongoing "blog", it is a rich source of information and images. Barry Miller has also written some Excellent Articles about Antique Microscope Slides and Preparers from the Victorian Era. These papers were initially published on the Micscape website, and he has kindly allowed us to make them available here as well. Micscape Magazine: Exploring the Miniature World, and Microscopy-UK website, two of the best amateur microscopy sites on the web. The Quekett Microscopical Club was founded in 1865, "for the friendly exchange of ideas between people interested in the microscope for intelligent recreation." If you're not a member, you should be! The Manchester Microscopical & Natural History Society was founded in 1880 from the Manchester Literary & Philosophical Society which was formed in 1858 "to provide for the pursuits of those interested in microscopy and natural history." 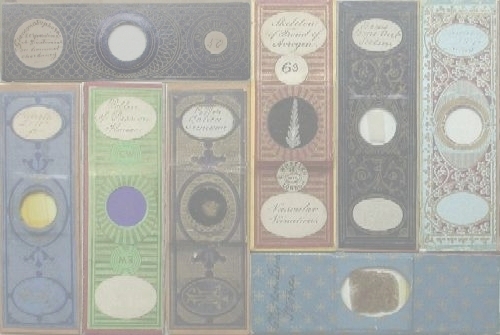 The Postal Microscopical Society was founded in 1873, "its primary aim the circulation of boxes of microscope slides and notes to the members." The Micropolitan Museum "The Institute for the Promotion of the Less than One Millimetre"
Micrographia, "is for those who use microscopes in their investigations of the world around them"
Savona Books specializes in Microscopy and Related Subjects. A must "Browse" site! The Gemmary A wonderful source for the Collector, featuring Antique Scientific Instruments and Accessories, Old and Rare Books, Antique microscope slides, Information and Resources. Highly recommended! The colourful and interesting Graphics Collage Images that have been added for the "Home", "History", "Insects", "Marine", and "Botanical" slide sections are the work of Sue Hughes, a wonderfully talented Freelance Artist from Pittsburgh, PA USA. Click the link above for further information.